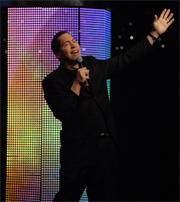 Roy performs his multi-media review before audiences in Las Vegas, at major sporting events, meetings, formal events and conventions throughout the world. The accomplished singer, impressionist, and humorist has shared the bill with notables such as Frank Sinatra, Michael McDonald, Gladys Knight, the Doobie Brothers and Smokey Robinson. Television appearances include David Letterman, Jay Leno, Bob Costas, Nightline, Larry King and Bill Maher. Firestone has performed for hundreds of corporate clients including: AT&T, Kodak, Pepsi, Nike, Toyota, Northwestern Mutual, General Foods, Lincoln Financial, Thrifty Car Rental, John Hancock, Anheuser Busch, Hewlett Packard, Honda, OfficeMax, Chevron Conoco Phillips, Transamerica, Frito-Lay, Wachovia Bank, LoanToolBox.com, Sara Lee and Blue Cross Blue Shield. Roy Firestone’s show is a highly energetic mixture of storytelling, music, humor, uncanny vocal impressions, hilarious and unforgettably moving video clips and heart rendering observations. The show is a celebration of life not just through the prism of sports but in his 20-year association of the greatest names in American public life. Whether it’s Firestone’s witty and satiric look at American sports or his touching story telling that evoke both laughter and tears, Firestone delivers a standing ovation winning One Man Show that is truly unprecedented in both keynote speaking and entertainment circles. 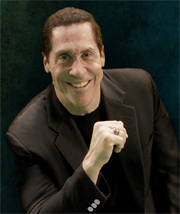 Roy Firestone’s One-Man Show . . . Up Close Live is like the champions he interviews . . . a winner! Notorious basketball bad boy Dennis Rodman cried on Roy Firestone's sports talk show. So did Barry Bonds, the enigmatic and aloof superstar of the San Francisco Giants. And even tough guy Jimmy Johnson spoke poignantly to him about the emotional trauma he suffered upon stepping down as head coach of the Dallas Cowboys. Firestone's ability to elicit revealing responses from sports celebrities is a principal reason Sports Illustrated once called him "the best interviewer in the business." The host of ESPN's "Up Close Primetime" sports specials believes that at heart he's much more of a good-natured humorist than a soul-searching inquisitor. Tonight in San Juan Capistrano, Firestone will showcase not only his comedic abilities but also his talents as a singer and impressionist. His show will benefit the Rod Carew Pediatric Cancer Unit at Children's Hospital of Orange County. "The funny thing is, I have a reputation for making people cry," Firestone said in a recent phone interview. "But in performing circles- I have a much bigger reputation for making people laugh." Firestone has been delivering his live comedy show nationwide for some nine years, but mostly at private, corporate events. In his 1 1/2 - hour show, Firestone delivers sports-oriented comedy bits and songs. One sketch finds the Miami-raised, Los Angeles-based performer bringing the comedian Woody Allen and boxer Mike Tyson together. He also does impressions of such pop singers as John Lennon and Smokey Robinson. The multimedia show is big on musical parodies. With the aid of film clips flashed on giant video screens, Firestone turns Cole Porter's "I've Got You Under My Skin" into "I've Got Golf Under My Skin." "Let's Call the Whole Thing Off" is delivered with a video piece featuring hot - under - the collar sports figures erupting on the playing field. "I want to encourage people to you're come out and kind of be tough Be skeptical. Being on television, you're given a little bit of the benefit of the: doubt for about 10 minutes. But if you can't deliver [onstage], you're not going to get much beyond 10 minutes." Firestone, 43, joined KCBS-TV Channel 2 in L.A. in 1977, where he worked As a sports anchor and reporter for eight years. He entered the world of TV sports talk shows in 1980, hosting USA Network's "UpClose" program. At the end of 1994 he ended four years as host of ESPN's half-hour "Up Close" interview program and began hosting the new, hour long "Up Close Primetime" for the sports cable network. "Up Close," with a new host, airs five days a week while the latter show appears only about once every three weeks. So why did he give up the air time? "I'd done 4,000 [sports interviews in 14 years, and I got to the point where I only wanted to do the biggest people," he said, adding: That he also wanted to fit other work such as stage shows, into his schedule. "Being in the studio every single day took me away, frankly, from a lot of money" that could have been made elsewhere. "So that was one of my motivations Also, I wanted to move into other areas. One of his goals is to develop a bigger act for Las Vegas. "Up Close Primetime" has allowed Firestone to interview sports personalities: who might not have been available to him before. "Up Close" is taped almost exclusively from a Los Angeles studio. For "Up Close Primetime," Firestone does interviews mostly on location. Last year, "we got at least 70% of our interviews with people we could never get in the studio," he said. "It's just hard to get people to come to the studio anymore or even to do it via satellite. "I've gotten guys I've never dreamed of getting in the studio. For instance, [Indiana basketball coach] Bobby Knight will be on Feb. 7 for an hour. We're going to go hunting with him and spend some time with him on the court. I've just done a show with the 11, surviving 500 home-run hitters in baseball history." One highlight of 1996 for him was his appearance in "Jerry Maguire," Cameron Crowe's current hit film about a sports agent. In the Tom Cruise vehicle, a self-absorbed football player portrayed by Cuba Gooding Jr. appears on Firestone's sports talk TV show. "It's kind of a spoof of my show," he said. "I've probably gotten more response from this scene than the I9 years I've been on television."